After many months of planning, today was the day that personalised learning really took flight at Hobsonville Point Secondary School. We have tussled with the tension between curriculum coverage and personalising learning for the past few months and today students saw what this has resulted in. Most New Zealand Secondary Schools place students in form classes for the “core subjects” (English, Maths, Science, Social Studies and Physical Education/Health) whilst allowing some measure of choice over the “option subjects” (Technology, Languages and The Arts). All of these Learning Areas are compulsory up to Year 10 in the New Zealand Curriculum, so we had set out to avoid the ancient hierarchy of subjects that dominates NZ schools. Groups of teachers from all curriculum areas worked together to create modules that maximised the natural connections that existed (Our Part Time teachers of Languages, Dance, Fabrics and Music only started 2 weeks ago so have only been able to offer SPIN modules for Term 1, this will change for Term 2 onwards). We have not forced integration as we believe that enough authentic connections exist that can be utilised to maximise learning. Big Modules see 3 teachers working together, Small Modules have 2 teachers collaborating whilst SPIN modules are single disciplines. What follows are the options that students have for these different modules in Term 1 to cover the concept of Identity. 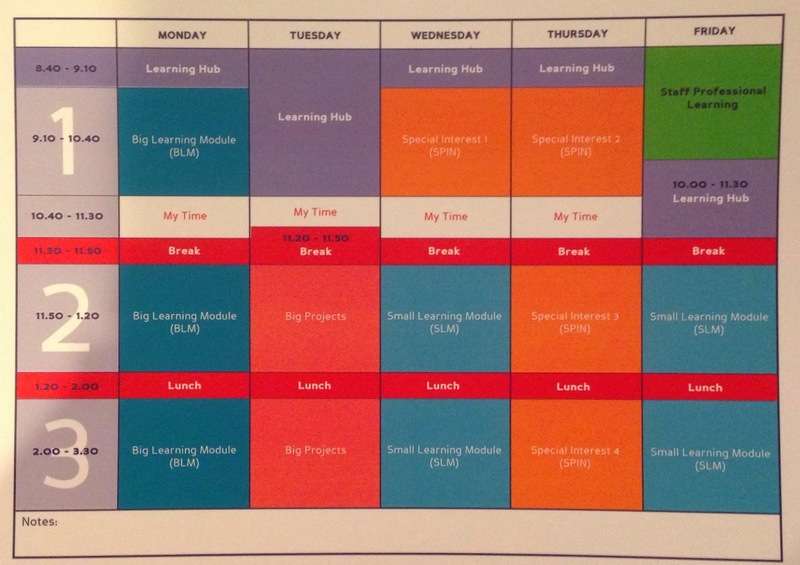 Big Modules involve 3 teachers working together and run in all three 90 minute blocks on Monday in your timetable. In this module we will explore your identity through the artefacts and interests that represent you. We will look at how different people choose to represent themselves with different objects. You will then decide how to share your museum of yourself. If you were a brand what would you look like? Where do you fit in? How/why do we judge? Is that a problem? By taking this big module you will be challenged to think about and answer these questions. How do we express ourselves? Individuals leave their mark, express their voice and reflect on culture and history in many different forms. In this module you will explore how identity is expressed through a range of mediums such as; Music, Lyrics, Food, Art, Film and History. You will then choose a range of mediums in which you show us, how you express yourself. Small Modules involve 2 teachers working together and take place in two 90 minute blocks. Small Module A runs in blocks 2 and 3 on Wednesday. Lets think about our identity on the internet and how we harness it’s power. You will use social media like Youtube, Blogger and Twitter to spread your personal message to the world. Our identity as both individuals and as a country is clearly seen in the unique culture that is displayed throughout our city. Join us as we explore the culture we have developed because of the immigrants that have travelled to New Zealand. We will explore the foods, techniques and rituals that we have adopted and the integration of these elements into New Zealand culture. We will research and cook many of the foods from a variety of cultures and consider the processes and rituals associated with those foods. In this module we will explore the notion of who controls our identity? We will study film as a way to explore ways in which control is portrayed in society. We also start in on organisation inside the World of Science which we will use to probe and inquire into scientific articles and events. We will delve into the concept of 3-D printers and the futuristic uses. In this module we will deconstruct the chemistry and biology of you. We will look at the amazing molecule DNA. You will have the opportunity to: extract DNA, build a 3D model of DNA and screen print your DNA image. Small Module B runs in blocks 2 and 3 on Friday. Digging Deeper – fact or fiction? Have you ever wondered why people say one thing and do another? How do you know what you are seeing and reading is the truth? Do you believe that actions speak louder than words? Let’s dig deeper under the surface and learn to determine fact from fiction. In this module you will investigate the significance of the historical, biological and contemporary influences on us. This will include situations such as geneaology, genetics and social media. We will then consider which is the most important influence. In this module we will explore stories from the past (myths, legends and heritage stories) which shape our identities. We will find ways to bring these stories to life. The children’s book ‘Old MacDonald’ by Donovan Bixley illustrates NZ kiwiana icons. You will investigate existing representation throughout New Zealand e.g. The L&P bottle in Paeroa. You are to design and develop a 3D Geometric representation of a chosen icon from any area in New Zealand. Puzzles, problems and super powers. Use your creative powers to recreate maths. You will learn about technical drawings, sketching, drawing and modelling. Spin modules are single discipline courses that involve just one teacher and run for one 90 minute block a week. These courses allow for students with a high interest in one subject area to pursue that passion further. Within these modules you will also find the Active Recreation courses of which every student MUST choose 1 out of the 4 blocks. Spin A runs on Wednesday Block 1. Design and develop a 2D or 3D representation of your family history/genealogy. You will produce the 2D or 3D representation in an innovative manner. This could be as a book, jewellery, sculpture, jigsaw, frame etc. What are symbols? How are they incorporated into art works? Why do artists use them? This is your opportunity to learn more about symbols that are used within images and is your chance to consider creating your own personal symbols. NZ on Film will explore how New Zealand and New Zealanders are portrayed in NZ film and TV. You will be introduced to film (visual) techniques then get the chance to make a short video clip and explore a NZ film or TV series of your choice. Music helps us define our identity. Express and communicate your identity through songwriting, composition and performance. In this module we will explore the skills for using a frisbee in team building games. We will explore games such as goaltimate, frisbee baseball, and throwing race moving towards the goal of ultimate frisbee tournament at the end of the term. A variety of traditional and modified activities and games. Welcome to our beginners’ course for te reo Māori and culture. With the support of waiata (songs), kemu (games) and other interactive activities, you will learn simple language to enable you to communicate in everyday situations, such as meeting people, introducing yourself and your whanau, and talking about your feelings, likes and dislikes, and interests. We also explore some important cultural knowledge such as; powhiri, the marae, matariki, and myths and legends. Spin B runs on Thursday Block 1. How can you represent yourself in a drawing? Does a portrait have to include a face? This is your chance to build on your understanding of self portraiture while strengthening your drawing skills. What is product branding? Why is it so effective? What is digital identity? Design and develop a logo to represent yourself. This will be produced on a T-Shirt or other personal item. A range of high intensity fitness activities to help with sport specific fitness or for individuals wanting to improve their general well being. This AR spin provides you with the opportunity to be active through skateboarding, scooting, and cycling. Manipulate material and explore different artists and designers while working towards the creation of a mural based on identity. Learn how to sew or bring existing knowledge into this unit, any ability level is welcome as we learn about layout, design and fabric. A knowledge and understanding of te reo Māori and Māori customs is in hot demand for all sorts of careers: Law, Health, Media, Education, the Arts, Sciences, and Government. In this FULL YEAR course we will use everyday contexts such as meeting people, family and school life, sports, food and cultural themes to learn simple language to enable you to communicate with confidence, together with gain an understanding and appreciation of tikanga Māori. Other cultural opportunities may include noho marae, pōwhiri, Manu Kōrero, Polyfest, toi Māori (raranga, whakairo, taniko), or ngā mahi ā-Rēhia (pastimes). Ever wanted to learn the saxophone like Lisa Simpson? Play the clarinet like Taylor Swift in the ‘You Belong With Me’ video clip? Mesmerise your friends with a rendition of the Titanic theme on the flute? This is your chance to learn a woodwind instrument and discover the musician in YOU! Instruments provided. Beginners only. Spin C runs on Thursday Block 2. Students will explore a range of biographical film clips.You will complete a close reading of a bio fim (visual text) of your choice. You will then produce a short biographical clip or info graphic about yourself, relation or ancestor. In this module you will create and construct a story box which tells the story of you. Using things we can see we will make a box about things you can not see. This netball AR is optional for all skill levels. You will take part in a variety of sports and physical activities. Through participating in these you will explore influences on identity for you, others and society. Learn how to meet and greet, count, talk about yourself, your family, your likes and dislikes and food in the beautiful language of French. By the end you will be well-prepared for the full-year course. Dust off your instrument, find your music stand and rediscover the musician in you! A weekly music module designed to develop the performance skills of all woodwind, brass, piano and string players in solo and ensemble/group situations. Own instruments required. Unsuitable for beginners. A practical/physical and FUN dance module exploring the identities of dance in popular culture from different time periods( 50’s rock n roll, 80’s disco and 90’s pop. From the beginnings of ballet through to the rise of hip hop dance) .Students will develop their practical knowledge and physical fitness and will be moving and learning pre choreographed routines each session to develop an informal showing or performance. Students will have fun being physical, developing spatial awareness and gaining small tasters of different dance styles. No prior dance experience required! To all those who wish to learn how to sew, or already know what they are doing, this is for you. This 9 week unit will combine design, fabric, composition and material manipulation, ending with a personalised device cover that will showcase all the skills learnt in this cycle. Spin D runs on Thursday Block 3. Should we make glow in the dark cats and potatoes? Should we make kiwi fruit that peels like bananas? Look at genes in your family and environment to decide whether we should have genetic engineering in New Zealand. Design and develop a visual 3D representation of yourself. You will research and investigate a sculpture artist. Applying these ideas you will design and develop a 3D wire sculpture inspired by a selfie photo. Exploration of minor and major games and sports, where being active is explored in a fun way. Through physical activity you will investigate the way in which sport, society and the media create stereotypes about individuals. A physical course designed to challenge students perceptions of ‘dance’ as we know it. We will explore creating our own choreographies and performance art work as a whole group working towards a final performance. Students will learn new tools to create performance works and develop self confidence through sharing of ideas and works in progress.We will explore non traditional forms of performance to create something unique and exciting! An appropriate change of clothing/physical education gear will be required. No prior dance experience is required, just a willingness to create and share ideas. Spanish is the second most widely spoken language in the world so is a great language to travel with. In this course you will learn numbers, how to meet others, how to talk about your family, yourself, your likes and dislikes and food. It will prepare you for the full-year course in Spanish. Is your family “normal” in the context of NZ/US television series? What is “normal” and how has the idea and identity of families changed over time on screen? Can a group of 2D, four-fingered yellow cartoon characters be the most realistic family on TV? Let’s analyse what is being presented and make our own reality TV! For me, these course offerings are incredibly exciting and the buzz from the students as their selection booklets were handed out shows that they felt the same way! Students have taken their booklets home and have 2 nights to discuss this with their whanau before their choices are entered with their Leaning Coach on Wednesday. This is only Term 1 and the very first offering of modules at Hobsonville Point Secondary School. For me personally, I am rapt with the courses offered by our awesome staff. I hope you agree that this is a very promising start to delivering a personalised learning programme that also allows for the curriculum coverage students require to reach both personal and academic excellence. This entry was posted in Uncategorized and tagged 21st Century Learning, curriculum, Hobsonville Point Secondary School, learning, New Zealand Curriculum, personalised learning by stevemouldey. Bookmark the permalink. Wow! Steve that’s awesome. Really awesome.